Château de Beaucastel along with Vieux Télégraphe ‘La Crau’ was one of the 1st great Châteauneuf’s I tried. The wines are beautiful, sophisticated & layered with delicious flavours! Alongside Vieux Télégraphe, Clos des Papes, Charvin, and, the epic Rayas, Beaucastel, is one of the great established names of the region. Blended from 13 red and white grape varieties, it’s no surprise that their wines have incredible complexity. Add to that the almost 110 years of experience and a truly special wine ends up in our glasses. Despite the potential for the heat of the region to yield over the top wines, the Family Perrin focus making wines of great freshness and sophistication. 2015 is undoubtedly a bold year. I can’t wait to see what Beaucastel have delivered. If the reviews are anything to go by we’re in for some fun! The 2015 was at the top of a list of 250 wines from the Southern Rhône tasted by Nick Stock late last year. With a history traced back to the 1500’s Château de Beaucastel has long been regarded as one of the greatest wines in France. In 1909 the winery truly began it’s rise to the status of one of the worlds great estates. It is notorious for its elegance, balance and ageing potential. Beaucastel has an exceptional terroir at the Northern limit of Châteauneuf du Pape, exposed to the Mistral wind. All thirteen varieties of the appellation have been organically grown since the sixties. Each variety is harvested separately and manually. Vinification takes place in oak fermenters for the reductive varieties (Mourvèdre, Syrah) and in traditional enamelled concrete tanks for the Oxidative grapes (all the others). Once the malolactic fermentation is finished, the Famille Perrin blends the different varieties. The blend is then aged in oak Foudres for a year before being bottled. The video below follows the Perrin family through a year. As you watch, note the manual labour that goes into nurturing the vineyards and the wine. In the vineyard, you’ll see an incredible amount of rock “Caillou” which translates more accurately to pebble. These provide a mulch retaining moisture, they warm during the day to radiate heat back to the vines during the night. You’ll see the vineyards are on a relatively flat plateau, and the vines are minimally trellised as bush vines. In the warmer southern climate, of Châteauneuf this allows the canopy to shield the fruit from the sun and freshness to be retained in the fruit. In the winery you’ll see careful quality control, sorting fruit, the use of large Foudre, 5,000L barrels, and, the blending of 13 varieties to make the best expression of their site possible. Note the patience, of waiting to release wines, with 2015 only just released, it’s clear, that the wines are allowed to take their time to become complete before release. If your French is passable you’ll get a little more out of the following video. Watching it without comprehension will still give you an insight into the vineyards and Château. In the following video Marc Perrin explores the importance of blending the 13 varieties in making a complete wine, the only recent dominance, post-phylloxera of Grenache in the blend, the impact of the mistral on cooling the vineyards and maintaining freshness in the wines. Along the full length of the Rhône Valley we have seen stunning wines produced from the 2015 Vintage. Those that have timed picking perfectly have made exceptional wine. 2015 was a magnificent year in the south as well, characterized by excellent sanitary conditions thanks to the mild, wet winter, followed by a relatively hot, dry spring. The vines coped well with the extreme heat and lack of rain in the summer thanks to good hydric reserves. Following satisfactory flowering, rapid and regular ripening was assisted by rain that fell in August, producing berries rich in phenolic compounds and anthocyanins. As in the north, harvesting took place under excellent conditions. 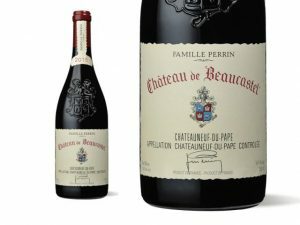 The classics were in good form, dangerously good, in fact, and Châteauneuf-du-Pape across the board presented its own magic mix of power and finesse. These wines are full of interest and detail, faithful to the terroir and exuberant without being simplistic or showy. Worry not that the Southern Rhône’s lustre had faded, for it exudes polish, charm and power for the 2015 vintage. It is one to celebrate, moving away from the caricatures of excessive ripeness and oak use. The highlights are many, topped by Beaucastel, Vieux Télégraphe, Mont Redon, Charvin, Domaine de la Charbonnière, Ferrand and the groovy, down-tempo wines of Gramenon. The classics are on form and they’ve trammelled the boldness of the 2015 vintage with style and grace. It is crystal clear that 2015 stands ahead of both the 2014 and 2013 vintages for Southern Rhône reds. There is a level of maturity and freshness that is rarely seen, and certainly was not visible in either of the preceding years. The ‘15s are suave and impressive wines. Châteauneuf-du-Pape literally translates to “The Pope’s new castle” and, indeed, the history of this appellation is firmly entwined with papal history. In 1308, Pope Clement V, former Archbishop of Bordeaux, relocated the papacy to the town of Avignon. Clement V and subsequent “Avignon Popes” were said to be great lovers of Burgundy wines and did much to promote it during the seventy-year duration of the Avignon Papacy. At the time, wine-growing around the town of Avignon was anything but illustrious. While the Avignon Papacy did much to advance the reputation of Burgundy wines, they were also promoting viticulture of the surrounding area, more specifically the area 5–10 km (3–6 mi) north of Avignon close to the banks of the Rhône. Prior to the Avignon Papacy, viticulture of that area had been initiated and maintained by the Bishops of Avignon, largely for local consumption. Clement V was succeeded by John XXII who, as well as Burgundy wine, regularly drank the wines from the vineyards to the north and did much to improve viticultural practices there. Under John XXII, the wines of this area came to be known as “Vin du Pape”, this term later to become Châteauneuf-du-Pape. John XXII is also responsible for erecting the famous castle which stands as a symbol for the appellation. Châteauneuf-du-Pape is traditionally cited as allowing thirteen grape varieties to be used, but the 2009 version of the AOC rules in fact list eighteen varieties, since blanc (white), rose (pink) and noir (black) versions of some grapes are now explicitly listed as separate varieties. Also in the previous version of the appellation rules, Grenache and Picpoul were associated with different pruning regulations in their noir and blanc versions, bringing the number of varieties previously mentioned from thirteen to fifteen. Both red and white varieties are allowed in both red and white Châteauneuf-du-Pape. There are no restrictions as to the proportion of grape varieties to be used, and unlike the case with other appellations, the allowed grape varieties are not differentiated into principal varieties and accessory varieties. Thus, it is theoretically possible to produce varietal Châteauneuf-du-Pape from any of the eighteen allowed varieties. In reality, most Châteauneuf-du-Pape wines are blends dominated by Grenache. Only one of every 16 bottles produced in the region is white wine. Temp: 15°C. 10-15 minutes in the fridge will if all it takes to drop the temp if they’re a little warm. ⏳Decanting: These wines love air and time in the glass. Marc Perrin suggest all of his wines should be decanted and enjoyed over several hours, if you can hold off! Cellaring: Marc Perrin talks of a sweet spot commencing at 10 years of age, tannin evolution being the most significant change. The wines are often capable of ageing 50 plus years. If you want to get the word on drinking windows from the Perrin’s download their iPad app and you’ll be able to access info on their wines as far back as 1960. Be patient it takes a while to update, you can choose between English, French and Chinese. Blend: 30% Mourvèdre ; 30% Grenache ; 10% Counoise ; 10% Syrah ; 5% Cinsault ; 15% Vaccarèse, Terret Noir, Muscardin, Clairette, Picpoul, Picardan, Bourboulenc, Roussanne ; 5% Roussanne, Bourboulenc, Grenache Blanc, Picpoul, Clairette, Picardan. All 13 grapes. This has a dark fruited, blueberry and blue plum nose with wide swinging tannins. Some white peppery elements, violets, brooding dark spices, blue fruits and dark plums. Builds from the ground up. Dark stones. Impressive, powerful. wine. Drink from 2025. A stunner from the get-go, with waves of thoroughly seductive boysenberry, plum, blueberry and raspberry reduction forming the core, while roasted apple wood, rooibos tea, bergamot, and anise notes flash throughout. Has plenty of bass, with a Turkish coffee accent and a hint of alder driving underneath. Everything moves in lockstep through the seriously long finish. Best from 2020 through 2045.